There were multiple fatalities at a Madden NFL video game tournament in Jacksonville, Florida on Sunday. One suspect is also dead. 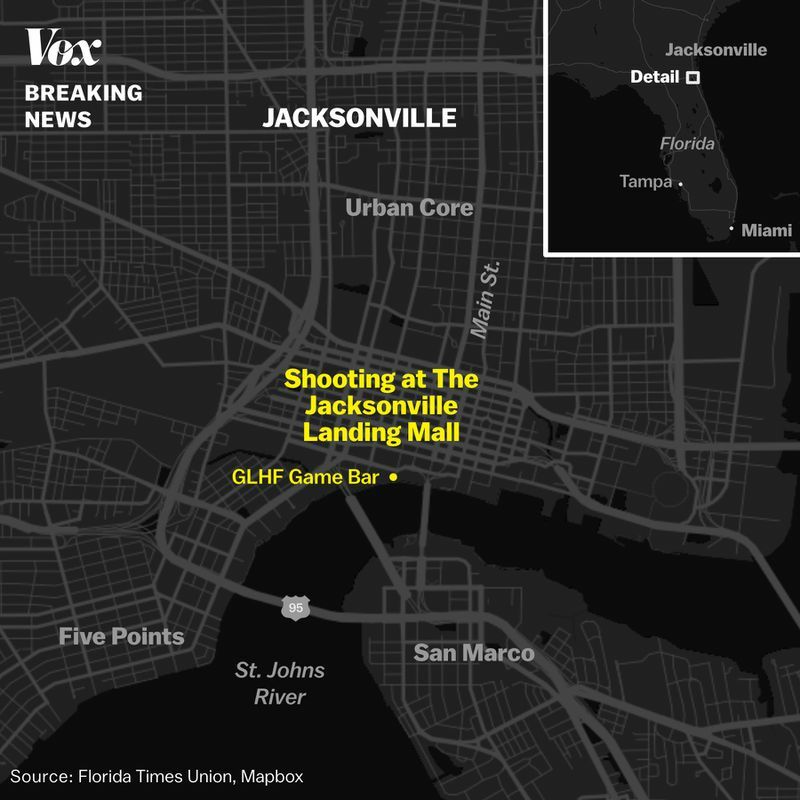 A shooter opened fire at Jacksonville Landing, a marketplace and entertainment area in downtown Jacksonville, Florida, on Sunday during a video game tournament there, authorities said. The Jacksonville Sheriff’s Office said in a tweet on Sunday that there had been a “mass shooting” at the Jacksonville Landing. It encouraged bystanders to stay away from the area, as it was unsafe. The incident reportedly took place during a Madden NFL video game tournament that was underway at GLHF Game Bar in Jacksonville. The tournament was being streamed on internet platform Twitch when the incident occurred, and video and audio of the shooting and aftermath swept across the internet after. The content is extremely disturbing and graphic. Authorities said there had been multiple fatalities at the scene, and others had been transported, presumably, to local hospitals. One suspect is dead, and it is unknown if there is a second suspect. A shooter opened fire at a Madden NFL video game tournament at Jacksonville Landing in Florida on Sunday. Here’s what we know about what’s happened so far. The Jacksonville Sheriff’s Office in a tweet around 2 pm Sunday afternoon said there had been a “mass shooting” in the Jacksonville Landing area and told the public to stay away. About 30 minutes later, officials said that there had been multiple fatalities at the scene, and one suspect was dead. According to CNN, 11 people were shot, and at least four were killed. The incident took place at GLHF Game Bar in Chicago Pizza in Jacksonville, where a Madden NFL video game tournament was underway. According to the event’s Facebook page, it was a $5,000 tournament and qualifying event for a national competition sponsored by EA Sports later this year. The tournament was being live streamed on online platform Twitch, and video and audio of the stream captured the incident and the aftermath. Be warned, the content is extremely disturbing and graphic. Authorities said they were finding people hiding in locked spaces at Jacksonville Landing and said SWAT was doing a “methodical search” of the area. City officials said in a tweet that Jacksonville Mayor Lenny Curry and Sheriff Mike Williams “are in contact regarding the situation.” Williams is expected to address the press at 4:30 pm. Mayor @lennycurry and Sheriff Williams are in contact regarding the ongoing situation at the Landing. Please follow @JSOPIO and all instructions from the Sheriff’s office regarding movement downtown. The mayor and Sheriff are expected to address media later today. Gamers apparently at the event tweeted about it the incident. White House Press Secretary Sarah Sanders said that President Donald Trump had been briefed on the incident and was monitoring the situation, according to the White House press pool. The exact number of injuries and fatalities. The identity of the shooter or his or her motivations. Whether there was a second shooter.